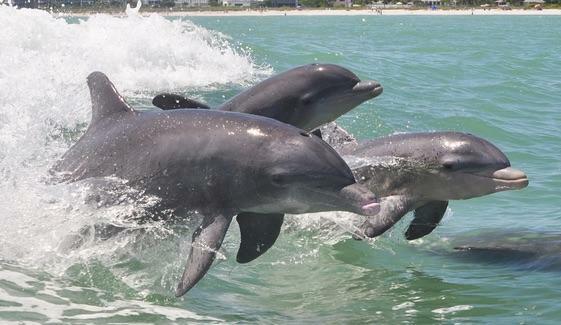 No matter where you are staying in Florida there are opportunities to watch or swim with dolphins. You can head over to SeaWorld in Orlando and watch the dolphin shows, visit the next door Discovery Cove where you can spend 30 minutes in the water in a controlled environment with an Atlantic bottle-nosed dolphin or you can head for the coast to one of a number of companies offering dolphin swims and dolphin encounters. Some companies offer therapeutic programs for special needs children. Even if you are staying in Orlando and do not have a car, you can take a two day bus trip to the Florida Keys including a dolphin swim. It is illegal to harass, feed, chase or touch marine mammals in the wild and so a wild encounter is a different kind of experience to the controlled encounters that take part in marine parks. All reputable companies will take time to teach the participants the correct way to deal with wild dolphins in their environment. Typically you are taken out by boat into the open ocean to meet wild dolphins in their natural habitat. Once the dolphins are found, you can either just watch them from the boat or go over the side and snorkel with them; you must be a confident swimmer to swim in the sea like this. Obviously there is no guarantee that the weather will be suitable, you will meet any dolphins or that they will want to spend time with you but if you want to experience as natural an encounter as possible then this is the sort of trip for you. Some companies will offer some form of 'no show' guarantee if no dolphins are found. As well as a one day trip, some companies also offer extended programmes / workshops of anything from 2 days to 7 days. If you do not want to go out into the ocean, then you can still either swim with a dolphin or even wade with a dolphin in captivity. There are really two kinds of controlled swim, the natural swim where you typically free swim using a snorkel with captive dolphins and the structured swim where you are one on one with a trainer (much like the swim with dolphins experience at Discovery Cove). Generally you need to be a good swimmer, comfortable in water 10-15 feet deep without using any flotation device. If you do not like getting out of your depth then some companies offer a wade with a dolphin programme where you can still cuddle and touch a dolphin whilst standing in shallow water. Before making your visit check with the operator exactly what gear you need to provide yourself and what is supplied or can be hired; for example, snorkel, fins, towels etc.